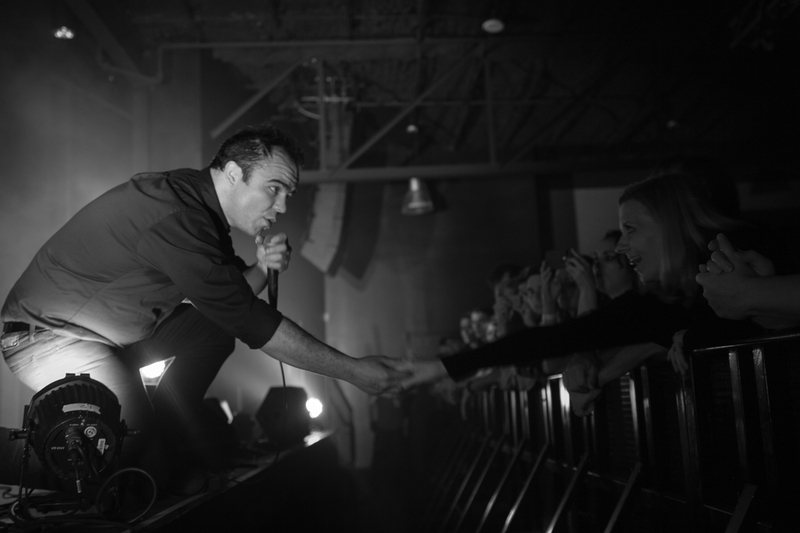 A touching moment with Future Islands at Music Farm Columbia. After opening up a run of Southeast dates in Wilmington, NC the night before, Future Islands noted early in their Columbia set that it was good to be back in the South. They’ve been touring the world non stop since the release of their breakout album Singles in early 2014. Both nights were special for Future Islands since it was the first time they’ve visited Columbia and Charleston since 2010, this time around playing for larger crowds in larger venues. That, and it was also Sam Herring’s birthday. Herring performed with all his usual flair, his dance moves getting more intense and sexual seemingly with every performance. Mid way through the set Herring was reminiscing on a show in Columbia about a decade ago where he was the victim of a wardrobe malfunction. “I felt a breeze and reached down and I was touching myself” he said talking about a show at New Brookland Tavern with his then band Art Lord & the Self-Portraits. What did he do? He went back stage and put some skivvies on over his white suit and played the rest of the show. That’s a story that’s floated around Columbia for years, finally confirmed by the man himself. Photos by David Stringer and Jess Spence.